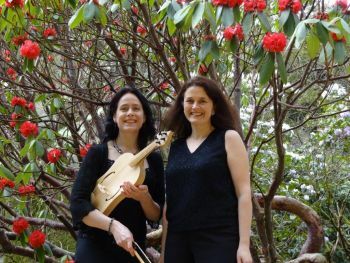 Faye Newton and Hazel Brooks met at the Guildhall School of Music and Drama in London where they discovered a shared passion for medieval music and poetry. They subsequently worked together in the award-winning ensemble Concanentes and in the year 2000 they formed ‘duo Trobairitz’ to explore the courtly song repertoire of the troubadours and trouvères, which is especially appropriate to their combination of voice and vielle. Following an acclaimed international debut at the Antwerp Young Artists’ Presentation in 2000, ‘duo Trobairitz’ rapidly rose to success and has appeared at major early music festivals within the UK and across Europe. The duo has collaborated with the Flemish theatre company fABULEUS for performances at the Belgian International Day of Early Music and broadcast live on British, Belgian and Slovenian radio. Performance highlights to date include a tour of Slovenia, a Dutch Early Music Network tour, the Leeds International Medieval Congress and the debut performance of its ‘Medieval Femme Fatale’ programme at the York Early Music Festival, which was later broadcast on BBC Radio 3’s ‘The Early Music Show’. Their debut CD 'The Language of Love' was released on the Hyperion label in 2007 to international critical acclaim, and was the American Record Guide Choice of 2007. 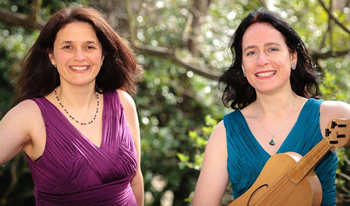 Faye and Hazel are both fascinated by the medieval period and thrive on the challenge of interpreting medieval music in a way that is true to its historical roots whilst being entertaining and meaningful for a modern-day audience. They enjoy the creative process of taking a melody and a text and, through a combination of scholarship and imagination, bringing the meaning and emotion of the text to life. The duo has been praised for its ‘glorious’ and ‘beautifully rich’ interpretations (Early Music Review), and aspires to take the performance of medieval music to the highest artistic plane.